SOUTH HOLLAND, IL – (ENEWSPF)–March 23, 2017. 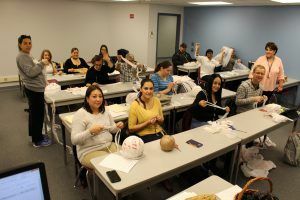 South Suburban College’s English as a Second Language (ESL) class once again participated in a “Mats for the Homeless” Workshop Service Learning project. The mats are created with plastic bags from the SSC Recycling Center. The students cut the bags into strips and make plastic yarn or “plarn.” They use the plarn to crochet mats for the homeless as a waterproof barrier. Millicent Collier, Service Learning Coordinator, said it takes between 600-700 plastic bags to make one mat. It is very labor intensive, and the ESL class has been a big help in this process. The students benefit from the workshop because it’s different than their normal classroom setting, and it provides a safe place for them to practice communication while helping the community at the same time. All students receive service learning credits in the process. Ms. Collier also noted that a lot of SSC instructors whose classes participate in these workshops see value in this Service Learning project because it helps our students develop stronger soft skills while serving the community and creates awareness of community needs. You can participate too! Recycle your plastic bags at SSC’s Recycling Center just outside the Bookstore OR attend a workshop on campus and receive Service Learning credits. For more information about Service Learning at SSC go to http://www.ssc.edu/academics/service-learning.